It offers administrative access to the back end of cPanel! Web Host Manager, or WHM, is a powerful program that allows administrative access to the back end of cPanel. WHM is Reseller end control panel. Those who purchase Reseller Hosting plans will get WHM control panel to manage the accounts of their clients. 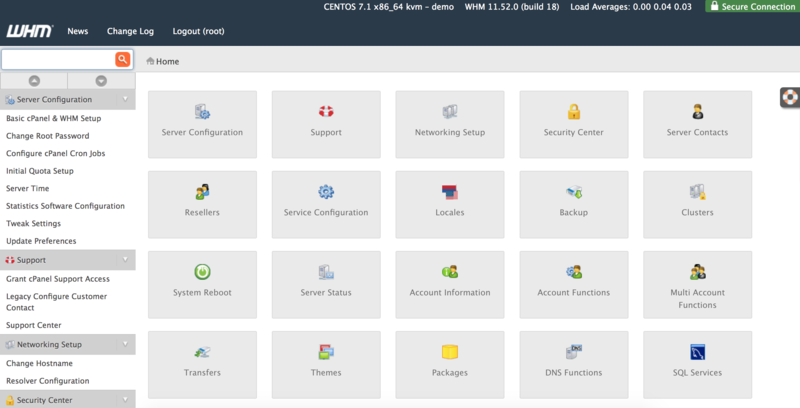 Their clients will have cPanel access to their account and to manage these C Panel accounts Reseller’s will have WHM interface to manage them. From WHM you can create accounts having separate cPanel access for you clients under your reseller account. You can terminate, suspend, check bandwidth and disk space usage of your clients and lot more. WHM makes it easy to, Set up and modify customer accounts, Receive alerts if the server goes down, Install applications and programming language modules, Create and apply hosting plans, Block spam, Integrate new web technologies, and Brand customers’ cPanel interfaces with custom logos. We provide WHM for FREE on all hosting plans.